A serious pest in heated buildings (though the oriental cockroach can tolerate cooler temperatures), cockroaches are primarily nocturnal (cockroaches seen during the daytime can indicate a serious infestation) and cluster in large groups. 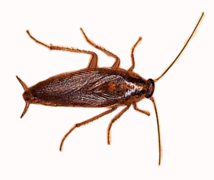 Cockroaches are known to carry and spread human disease organisms but are also a serious financial pest due to the contamination of foodstuffs. The element of human revulsion assocciated with cockroaches means that most people have a zero tolerance of them. Residual insecticide treatments are usually effective although serious infestations may require more than one treatment. In sensitive areas where spraying is not appropriate, gel baits may be used.